I’m not so sure the cilantro is going to survive. It laid over in the dirt and did not get back up even with a good watering, but the peppers and tomatoes were all very happy to be outdoors! 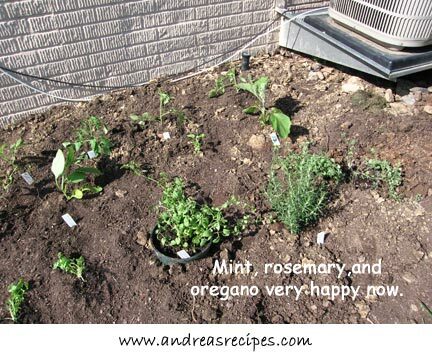 And so were the mint, rosemary, and oregano! We put the mint and oregano in the garden pots the black-eyed susans had been in and put the whole thing in the ground. Hopefully they won’t be tempted to stage a garden takeover now. Amazing what a little mulch can do. This area still had standing water in spots, and we were in mud with water squishing up around our shoes while planting, but the mulch helped with that problem. I started more black-eyed susans a few days ago, so we hope to add them here in a couple months. We need to fill this area with plants as much as possible to help control the water issues. This is the wettest May on record for our area, though we should not complain since we’ve been in drought conditions for over a year. I so enjoy spring planting and then I tend to be so nutty I go check the plants several times a day like they’ll have grown enough that I could see it 😉 I’ve always had difficulty with cilantro, just never got it to do. My neighbor grows it like a weed. Just can’t figure. 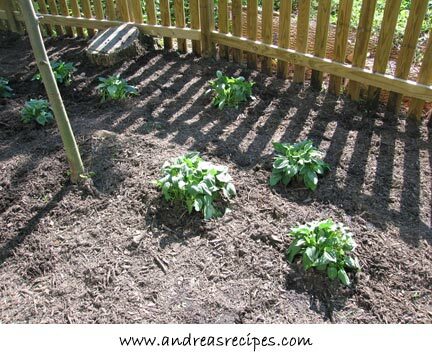 Andrea, kudos to you for persevering with your garden. I am useless at coriander (cilantro) too, although I grow it in a pot on my windowsill. I have never grown it from seed though and usually buy a plant and just try and keep it alive as long as possible. Looks yummy! I finally got most of my plants in the ground this weekend (still have basil, the last of the potatoes, and various seeds left). Careful about letting the mint go to seed. I had planted some lemon balm in a pot in the ground like you did with your mint, and while the clump is still in the pot, it dropped seed last year and I have new lemon balm plants coming up everywhere! Up to 30ft away in some places. Yay! Love gardens. 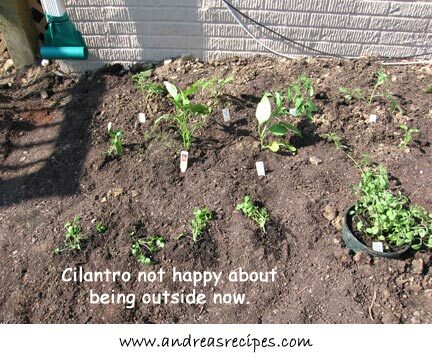 I’ll cross my fingers that the cilantro gets happy. Fresh cilantro seeds germinate quickly so let some plants go to seed. Mine germinated on my windowsill in 3-4 days.